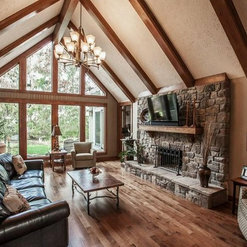 Best of Houzz 2016, 2017 & 2018! 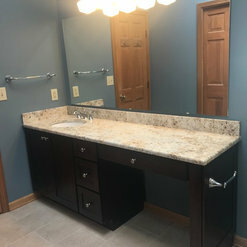 42 Projects for T. Morgan Construction, Inc.
Master Bath Remodel in Fishers, IN - Day and Night Difference! 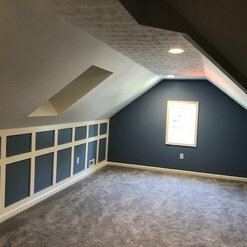 Carmel, IN Unfinished Attic Turned Into a "Man-Cave"
13 Reviews for T. Morgan Construction, Inc.
T Morgan construction completed a total remodel for our master bathroom. From the first contact, to the design, suggestions, and craftsmanship, T Morgan has been a complete pleasure to work with. They managed our expectations throughout the job and delivered a beautiful final product. Wonderful people and talented tradesmen! They are exceptional. The crew is knowledgeable and trustworthy. This was our first time hiring out a (large) project. They were not the cheapest quote but having good, solid, perfect work made the extra cost absolutely worth it. 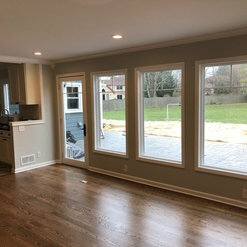 The only mistake we made in our project was hiring someone else to do the floor because it was cheaper; I would have gladly paid Tim’s crew more to get the job done right. I will only use T Morgan for any project moving forward. No need to look for anyone else. We had Tim and his T. Morgan crew build us a covered back porch with a fireplace. Through the entire process I felt like we were in good hands with Tim. He worked with us to design exactly what we wanted, listened to our feedback and priorities, and used his extensive experience to guide the design in the best direction. But what really stands out about the finished project is the level of craftsmanship. Every person that was part of the building process was skilled and detail-oriented. The result creates an awesome dramatic impact, but even the up-close details are nicely finished. T. Morgan Construction built a screened porch for me over an existing deck. I love my porch and have used it nearly every day since it was finished. The quality of construction is superb. Tim, Shani and the employees who built my porch were professional, courteous and knowledgable. I will call them next time I have a home improvement project. We were very pleased with the work T. Morgan Construction Company did for us in repairing our chimney. The workers were very professional, on time, and their work was excellent. 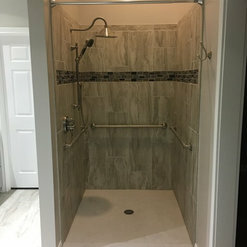 Having used T. Morgan Construction several times before, we would use T. Morgan again for future projects and recommend them highly to anyone needing professional work. Thank you, Elizabeth, for taking the time to review us. 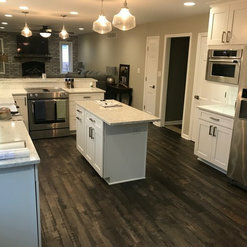 I hope you are still enjoying your kitchen upgrades as well! Just finished two additional projects with Tim and his crew. 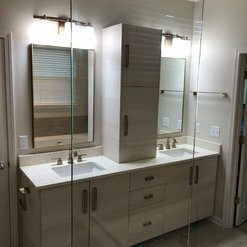 They have completely transformed the look and feel of our master bath and bedroom. 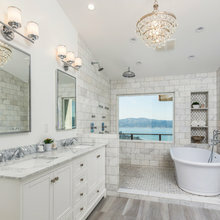 We had previously had the house up for sale and some feedback indicated that the master bath and bedroom didn't look and feel up to date with the rest of the house. Thanks to T. Morgan we certainly solved that issue! It is so nice to work with someone that you can trust and who charges down to earth prices. It makes it very easy to sit back and think "what would we like to do next". Thank you for your review. We certainly enjoyed working with you! 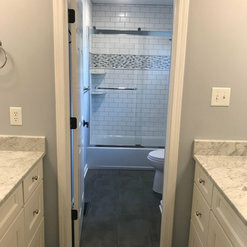 The T Morgan team did such a great job on our bathroom remodel that we added on two additional projects. Great people to work with and reasonably priced. Wish we would have found this team years ago! It has been such a pleasure serving you and Mike was very excited for the privilege to install that "fancy TV lift!" I am glad to hear that you will be working with one of our preferred painters, G.W. King Custom Painting, on your next project. Please always keep us in mind for all of your home remodeling needs! T. Morgan Construction, Inc. is an outstanding contractor/Construction Company that is very knowledgeable and professional. The employees as well as management goes out of their way to meet every need. This companies employees attention to details is phenomenal. I would recommend this company to anyone that is looking for a company to do home repairs or a new construction project. Mr. Jones -- thank you for your kind words! We are so pleased that we have served you well -- that is always our goal. Please enjoy your new addition! We are in the beginning stages of a sunroom for my home. So far we have had good communication regarding the timeline expected for this build. I have met with and discussed this with their subcontractors already. This is the only company that responded as I expected with written quotes and revised followup drawings, even before the work has started. They are very hands on. They respond to my questions in a timely manner. Though the weather and some supply issues have created delays on the project, we are looking forward to wrapping up the project very soon! Tim and the guys at T Morgan are an owner's dream. I wasn't the typical owner and I certainly didn't have a typical project. The T Morgan crew respected my ideals to do 'green building' as well as my desire to restore and maintain historic features, all while creating a modern live/work space in trendy Fountain Square. No small feat! The craftsmanship of the floors, tile work, closets, etc were all top notch. 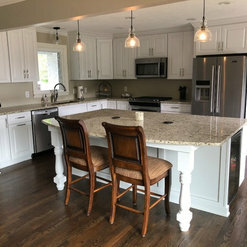 They helped me create cool features like large custom barn doors in the office and an amazing kitchen in a small space, that feels large and comfortable. They hooked me up with a outdoor earthwork crew that solved my drainage problem with a sustainable rain garden. These guys are open to new ideas and take pride in solutions that fit their clients. The respect Tim and his crew showed to me as a young, single, professional woman while they were in my home/office for months was appreciated beyond words! 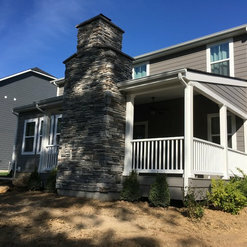 Clients like Jill often "force" you to take your company in a direction to which you were not previously fully committed -- like "going green" with new construction products, for example. Though we have always been advocates of adaptive reuse and recycling, it takes extra effort to seek out certain types of building products -- like cabinetry. This project required our standard vendors to "dig deeper" as well. It was a positive experience for all of us! And, we are always thankful for clients like Jill who make us better. Over the last 12 years, T. Morgan Construction has completed many projects at our home. 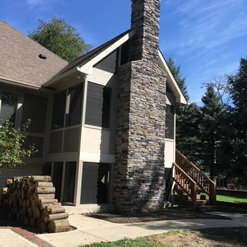 The work has included a two-story screened porch; complete rebuilding of the numerous decks around our house; tile work; painting; window replacement; door replacement; water heater replacement; a complete bathroom remodeling; updating of all electrical, hardware, and an intercom system; installation of a lift (wheelchair) system; and landscaping. 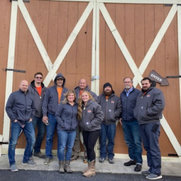 The reason we repeatedly hired T. Morgan is because of the high quality of their work, their attention to detail, and their ability to translate our wishes into exactly what we were hoping for. They are dependable - doing what they say they will do when they said they would do it. Costs are communicated accurately. Repeat clients are key to the success of businesses of any industry -- construction, especially. Our high quality of work, attention to detail, and concise customer communication are keys to repeat business. Did a fairly large remodeling job...adding a master bath and master bedroom suite. Very professional and knowledgeable. Respectful of our family's day to day life. Wonderful craftsmanship. Responsive to our needs and last minute changes. Will use them again for future projects. Getting ready to launch another project or two with this client -- so thankful for the repeat business! 8 Ideabooks for T. Morgan Construction, Inc. 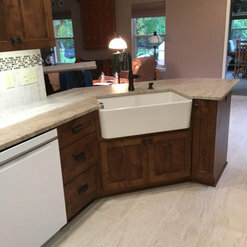 Commented: Love the counters! What material and name is it?This is a 3cm granite called &quot;Sahara Gold&quot;. This is a photo from 2007, so chances are that the current &quot;Sahara Gold&quot; quarry looks different than this.